What Budget Should I Have When Shopping for an Antique Rug? While there is a great deal to consider, there are two factors that are critical – how much can one afford, and how much should one have to spend? The first issue depends on the buyer’s finances. The second issue will depend on a number of factors such as the type of rug that one requires or desires. 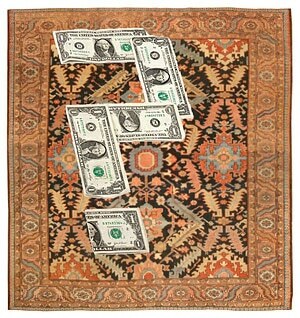 Things that would help determine how much one should spend on a specific type of rug would include considerations such as the specific rug’s size, how old it is, how finely woven it is (quality), how rare of an example it is, the overall condition and of course what the current market demands may be. While deciding how much to spend is ultimately based on the buyer’s financial resources, it does also involve the level to taste and sophistication a buyer may have. As one looks at rugs and hones in on the style and general look and feel of the carpet they are looking for, they will begin to narrow down the price range and get a good feel for how much such pieces should cost. While antique rugs do vary a lot, and while costs may differ based on the rug dealer, certain price bracket patterns do start emerge. Ultimately, people can spend what ever they wish but aligning the expectation with the reality of ones budget will go a long way towards a far more efficient use of time while navigating the world of antique rugs.